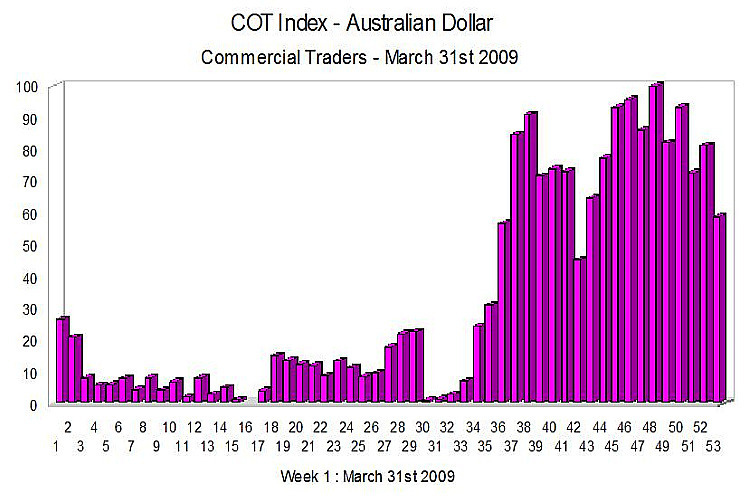 The COT data for this week shows an increase in the cot index which is now starting to climb away from the extreme lows of the last few weeks, suggesting that we are now seeing the long awaited reversal in the Australian dollar, a move which is reflected in the spot market against many other currencies, of which the US dollar is typical. A look at the weekly chart for the Aussie dollar, reveals a double bottom over the last 6 months, with a breakout from this trading range now imminent, and with a wide spread up bar, the AUD/USD pair are poised to break through the resistance level at 0.7090. However as always we need to bear in mind that the COT index is a direction indicator only, and not a timing indicator, and should only be used to reinforce or support our view of the spot market. All the latest fundamental news is now available on the economic calendar, and if you are looking for the latest live price for the AUD/USD currency pair, then just follow the appropriate link. Finally, if you are looking for a good ECN broker I have provided some details on what to look for when choosing your broker.